Anyone asked to think of a sunny place probably would not put Scotland at the top of their list. That might be why Scots try to make the most of the little sunshine they have, especially when it comes to transforming it into energy. With that same goal in mind, an international team led from the Glasgow Caledonian University has been working hard to create pavements that convert photovoltaic (PV) energy into electricity. Solar panels are not a new thing, but they are often found on our roofs and not on the ground where they could be damaged. With this in mind, Dr Azmy Gowaid and his team accepted the challenge put forward by the organisers of the 2022 World Cup in Qatar, who invited competitive bids for innovative designs to deliver renewable energy to the football tournament. 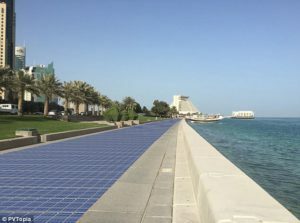 The team secured £75,000 in funding and began to think about the best way to make sure that PV tiles would withstand the weight of people walking on them. Where could they find such a resistant material, able to withstand inclement weather as well as millions of steps every day and yet still let light come through? Epoxy to the rescue! Rather than glass, these new photovoltaic tiles have an epoxy cover and are supported by a recycled plastic frame with an embedded concentrator lens. This combination makes the tiles very durable. “Should this prove successful, it is our dream that this product can eventually be installed at mass scale anywhere in the world – even in rainy old Glasgow,” said Dr Gowaid. But before hitting the Highlands, the tiles will be used in Doha where the ground temperature can reach 80°C. 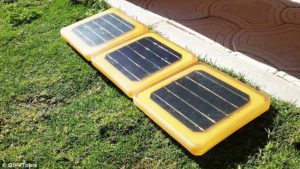 Luckily, these solar tiles are also equipped with an innovative cooling mechanism that will make them infallible in such extremes temperatures. We will have to wait four years to see these solar pavements that will draw on the sun’s energy. In the meantime, this is yet another example of how epoxy innovation keeps contributing to making our world more sustainable. Read the full story in BBC, Scotsman and Daily Mail.